Kentucky Heartwood seeks to protect and restore the integrity, stability, and beauty of Kentucky’s native forests and biotic communities through research, education, advocacy, and community engagement. Kentucky Heartwood runs on a very small budget. By donating and becoming a member, you are helping protect some of the most incredible forests in the world. 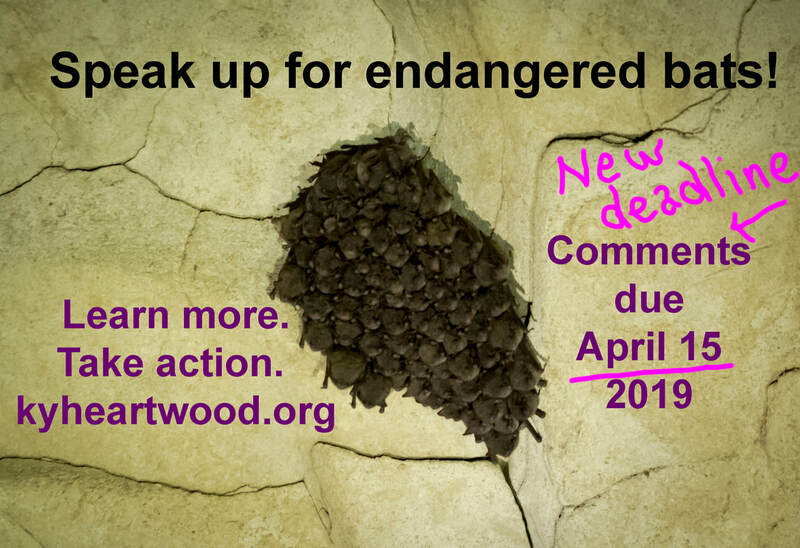 Kentucky Heartwood is a 501(c)3 nonprofit organization. Donations are tax deductible. ​Choose the subscribe option to donate monthly, or use the Donate button to give a one-time donation. The U.S. Forest Service is proposing to reduce protections for endangered bats in an effort to increase logging on the Daniel Boone National Forest. Comments on the Draft Environmental Assessment are due by Monday, April 15th. ​Directions for sending comments, links to project documents, and more information here. ​Rise & Root Rewilding offers single-day nature camps to give kids a taste of the wild, play games, learn the basics of ecological systems, and get in touch with their animal senses; we also host an ongoing Forest School where kids have the opportunity to build deep connections with place and one another in a safe yet challenging environment facilitated by our mentors. More information and registrations forms are here. The Forest Service has proposed yet another new, large logging project, this time proposing over 4,000 acres of timber harvesting in the London District of the Daniel Boone National Forest in Laurel, Pulaski, and Rockcastle Counties. Learn more here. Kentucky Heartwood will hosted a presentation and forum in Corbin on the evening of Thursday, January 24th to discuss the Forest Pine Creek Forest Restoration Project. Click here for details. 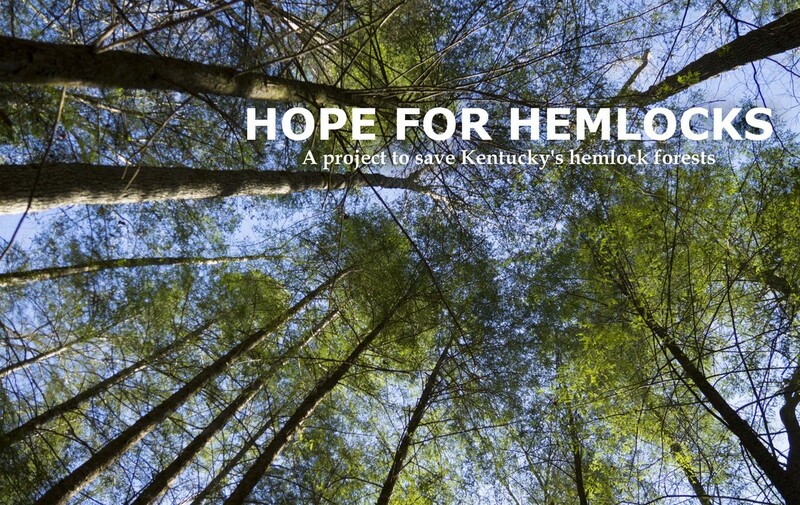 Hope for Hemlocks is a project of Kentucky Heartwood to save the Eastern hemlock (Tsuga canadensis), a tree of enormous ecological importance and breathtaking beauty. Hemlocks in the east, including Kentucky, are being decimated by an invasive insect, the hemlock woolly adelgid (Adelges tsugae). Thousands of acres of hemlock forests on public and private land have already been destroyed, but this isn't the end of the story. Join us as we use all the available tools to stop this ecological catastrophe. We need volunteers and donors and partners. We especially need your voice. On our website, www.hopeforhemlocksky.org, you'll find the history and science of hemlocks and adelgids, alongside the resources and information needed to preserve hemlocks for generations to come. It was an honor to present the 2018 Stuart Butler Memorial Award to Chris Schimmoeller! 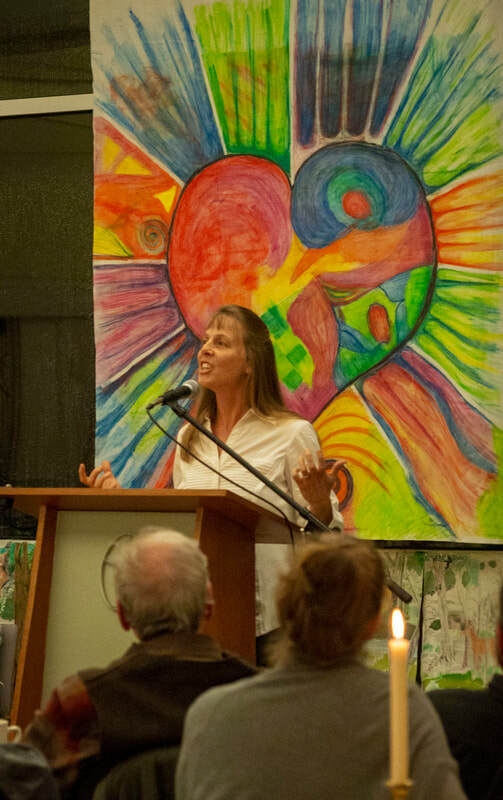 We heard so many incredible stories about different aspect of Chris' life, highlighting her tremendous spirit, loving nature and incredible ability to get things done. Speakers included Connie May, Jim Scheff reading for Andy Mahler, Connie Lemley, Bob Pekny, Jeri Howell, Hugh Archer, Perrin de Jong, Xyara Asplen reading for Betty Beshour, Andy McDonald,, Mark Schimmoeller, Trina Peiffer and Joel DuFour. The evening featured an outstanding potluck dinner and was made possible by numerous volunteers, including the Unitarian Universalist Church of Lexington, Connie May, Hannah Helm, Trina Peiffer , Larkspur Press, Alfalfa, Bluegrass Baking Company, Good Foods Co-op, Good Impressions Design, Tona Barkley, Holly Hill Inn, Lyn & Jon Akers, Laurie Schimmoeller, & the Kentucky Heartwood Council. Music provided by Nat Colten & Jeri Katherine Howell.​ More photos here. Click the image, or right here, to visit the Forest Blog. Volunteer Opportunity: We could always use help spreading the word about what is happening on our public lands. So, if you know of a place that would be good to put our newsletters, please lend a hand by printing out as many as you need and distribute them where you see fit. Or, let us know how many you need and we will mail them to you. Thank you! These are just a few photos from the 2018 Music Fest. Click here to view the full collection. Thank you to everyone who made the 2018 Music Fest a success! We had a record-breaking Music Festival this year! With sunny skies after lots of rainy weekends, the 13th annual event attracted over 350 people -- our biggest attendance yet. We also cleared nearly $4,000 for our frontline forest protection work, also a record. But the best part of the festival is the fact that it's become a tradition that we've all helped create. Thanks to each of you -- to our loyal sponsors that unfailingly underwrite the costs of the event each year; to the scores of volunteers who step up to help pull off the event; to the people who trek to Millville every year ; and to the children, whose talent and enthusiasm infuse the festival with joy. The music competition showcased unbelievable talent. Congratulations to our winners! For the 8—12 years olds, 1st place: Sophie Dufour; 2nd place: Caroline Johnson ; 3rd place: Morgan Wade. In the 13-18 year age group, 1st place: Marie Banderman; 2nd place: Myrion Campbell; 3rd place: trio Natalie Dufour, Phoebe Wagoner, Cora Weir. Thanks to our wonderful judges, Ben Griffith, Nancy Osborne, and Walt Baldwin! Once again Millville resident Jeff Alexander created the fabulous trophies for the event. We are grateful to be able to award such beautiful art to our winners. Our workshops and workshop leaders were awesome. Thanks to Katie McKone and Jessica Schuster for the stream workshops; Mark Schimmoeller for the Solar Cooking workshop; Jeri Howell for the Art of Nature workshop; Melissa Calhoun for the Herbs and Conservation workshop; and Lisa Munniksma for the Cooking from the Garden workshop! As always, our speakers inspired us with their passion and knowledge. Thanks to Megan McCoun, Andy McDonald, Jim Scheff, Nick Pennington, Jeri Howell, Austin Williams, Lacy Wallace, Margaret O'Donnell, Jess Ruble, and Jane Marie Watts. Many thanks to Mark Schimmoeller, Jennifer Lindberg, and Trina and Tim Peiffer for running the lemonade stand. Trina also ran the sports competition AND read a wonderful poem on stage. Our emcee Courtney Rogers kept things rolling from the stage the entire event. Jasmine Fouts helped kids get settled during the music competition. Seth Murphy of Blackhat Productions masterminded the sound. He wasn't tied to the soundboard all day -- with his new equipment he was able to adjust sound while walking around! Good job and tha nks all around! Students from KSU's Green Society created a fabulous obstacle course with straw bales, old tires, and a basketball goal! Eric Peiffer won the event. Eric also won the sport's competition! Ezra Corum's chalk drawing of a tree person won the chalk drawing competition. Fifteen year old Phoebe Wagoner wrote and produced the kids play, which featured talking animals and a spell-casting gypsy. Thanks to Natalie Dufour for production help. We also continued one of the festival’s best traditions: a kids’ parade of trees, animals and lots of noise that gathered folks at the stage in time for the awards presentation. Thanks to our vendors and all the groups that tabled. Elle Travis had long lines for her fantastic face painting as usual. Thanks to Josephine Sculpture Park and Levi Gordon for the art activities! Andrea Mueller and Mary Quinan took great photos; you can view them here. Doug Osborne, Morgan and Margi Jones, Rachel Harrod, and Emma McHone ran the registration table. Clay Goebeler, Danny Hess, Megan Willman-Dobner, Logan Ernst, Joel Dufour, Jane Marie Watts, Brad Slutskin, Trina and Tim Peiffer, and many others helped set up and break down. Thanks for doing the heavy lifting! Lee and Marianna Colten delivered ice to the festival. Marianna and Nat Colten put up yard signs around Frankfort advertising the festival. Charlie Schimmoeller and Logan Ernst helped with signs and banners. Velda and her crew grilled grass-fed burgers from Franklin County’s Mefford Beef. Thanks to John and Velda Watts and the Millville Community Organization for being such welcoming and hard-working hosts! Ben Griffith loaned us his keyboard for the competition. Melanie Van Houten and BJ Duvall loaned us the use of Josephine Sculpture Park’s ice cream freezer and lots of pop up tents. Brian Baker loaned extra chairs. Thanks to Lyn Cruz and Jim Daniels for running the ice cream stand all day and to Trina and Tim Peiffer for making delicious lemonade! Thanks to their generosity, all the proceeds went to Kentucky Heartwood! Anchoring the festival was the fantastic music of Lylak and The Don Rogers Band. Our next event is the Stu Butler Memorial Dinner on Saturday, Dec. 1 at 5pm at the Unitarian Universalist Church in Lexington. Hope you can join us! THANK YOU TO ALL OUR AMAZING SPONSORS! Forest in Little Egypt protected from logging through citizen engagement and the NEPA process. Celebrating The Forest: 25 Years of Kentucky Heartwood from Sellus Wilder on Vimeo. We are excited to share this video with the world! Take a journey through the history of Kentucky Heartwood. Shot and edited by Sellus Wilder, and produced by Joel Dufour. ​Read our press release, including our formal objection, by visiting our blog post for this story (scroll to bottom of the post to download the pdf of our objection). Kentucky Heartwood's project, dedicated to the past, present, and future of old-growth forests in Kentucky, featuring information, photos, and maps of a growing number of old-growth forests. ​Visit and learn more about Kentucky Old Growth. After more than a year of hard work, Kentucky Heartwood and our allies with the Coalition to Preserve Land Between the Lakes succeeded in convincing the Forest Service to withdraw the Pisgah Bay Project and more than 4,000 acres of commercial logging! Did you know that the third oldest known shortleaf pine on the planet lives in Rockcastle county, Kentucky, in the Daniel Boone National Forest? It is 319 years old (as of 2016). It stands in a forest that was proposed for logging in 2010. After a public campaign led by Kentucky Heartwood members to save Climax and Little Egypt, the logging project was withdrawn. This tree stands because people cared and stood up to protect our public forest. Learn more about our proposal to develop a hiking and equestrian trail system that would take visitors not only to see this magnificent tree, but also promotes the cultural and natural history of Rockcastle County. ​If this upsets you as much as us, please consider becoming a member or donating to Kentucky Heartwood so that we can have the resources to effectively challenge these projects! Special thanks to the Fund for Wild Nature and Patagonia for continued support of our work!